Well winter is about to come to an end which most of us are glad to see it so we can all get down to some serious camping. We receive hundreds of e-mails on our projects, but the one question we are often ask is "How do you heat your Pop Up"? Winter does slow our camping down a bit but not as much as you might believe, Trying to heat a pop up has almost become a hobby with me !! 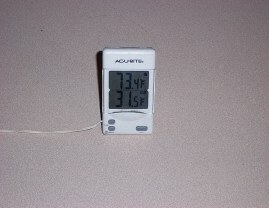 For one reason our pop up did not have a factory heater installed and a lot of the pop ups do not have them installed. So what do we do in order to heat this home away from home !! Most of the camp grounds we go to in the winter including our on private camp site has electric utility, so we use it. If you camp with no electric utility then we have a way that works great also, so here we go on How To Heat Your Pop Up. When camping in the winter, carry you water with you so that you will not have to worry about frozen lines and ect. We heat mostly with electric heaters and have found that the ceramic heaters are the most efficient and safe. By all means be extremely safety minded when children are camping with you. These appliance produces extreme heat and can cause injury like any other heater. Keep your heaters on the floor for safety and also because they will heat your pop up better. Remember hot air rises and you want to heat the floor as well. Most of the ceramic heaters on the market are 1500 watts which delivers 5120 BTU's of heat. On a 40 to 50 degree night this will work find as long as the wind is not blowing. On a 30 to 40 degree night 2 heaters works well for us. Most pop ups has 2 electrical circuits in the camper, ours has these two circuits; one rated at 20 amps and one rated at 15 amps from the factory. Two heaters can be run safely with these two circuits without any problems. Remember that a 1500 watt heater will pull on an average of 13 amps ! If you wanted to run another heater, then you will need to add another circuit and use the 20 amp plug that most campgrounds have in addition to the 30 amp camper plug in. I have done this to our camper so that we can run 3 heaters with no problem. 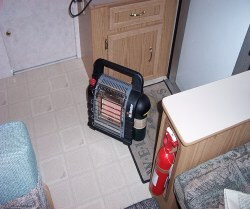 We can maintain a 70 degree reading inside the camper with 3 heaters and the outdoor reading is 20 to 30 degrees. To see how we installed another circuit just click on Add a New Circuit To Your Pop Up from above. Now surpose it is colder !!! What can you do !! Add the "Mr. Buddy Heater" This is by far one of the best heaters I have ever used. It is safe with a low oxygen shut off system that can be used in tents, campers and ect. Just click on the below picture and you will be directed to their site. After camping a many cold nights I have decided to make a chart so that it would be easy to decide on what to carry with you in order to stay warm and cozy. can do when running it on High. Now there is two other accessories you can use to stay warm ! You can use ceiling fans which will circulate the hot air in the ceiling and also electric blankets. Electric blankets pulls very low amperage and you can easily just plug it in or you can use sleeping bags. Camp in the Winter !! It's Fun ! !